Dawn Raudibaugh was born in Delaware County, New York and has spent most of her life living and working in the area. 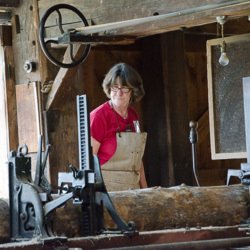 For nearly a decade, Dawn has been the Mill Manager at Hanford Mills Museum in East Meredith, New York. Dawn spent her early life in the country, enjoying the natural beauty of the area and the rewards of hard work on her family’s dairy farm. 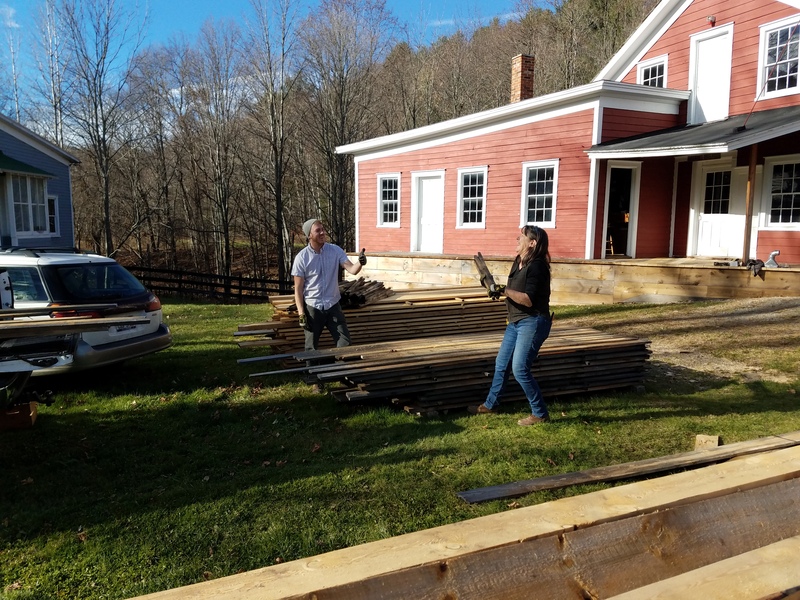 Her relationship with her father’s craftsmanship and construction on the property helped guide Dawn to her future interests as a woodworker and Mill manager, but she has worked for a number of different local businesses and has pursued a variety of different activities. During that time, Dawn has raised a family and now has grandchildren and great grandchildren. 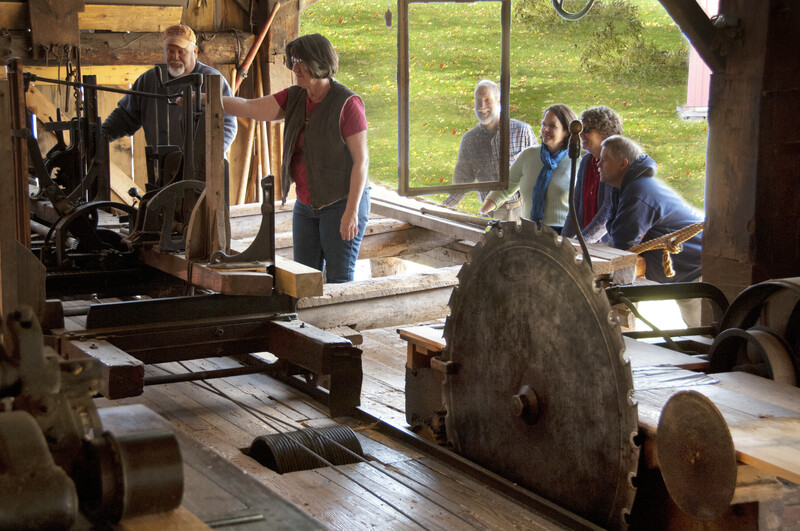 Dawn’s recollections include memories of her family farm and the natural world of her childhood, her various professional pursuits, the difficulties of balancing family life with work life, and her years as Mill Manager at Hanford Mills Museum. 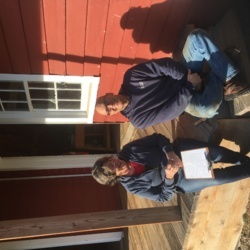 Some of the most interesting moments of the interview regard Dawn’s time at Hanford Mills. Having worked at the Mill in some capacity since the mid 1980s, Dawn has a unique perspective on the East Meredith community, mill operations, the history of the site, and the people she has worked with. This is Karl Wietzel interviewing Dawn Raudibaugh on Wednesday November 8th, 2017. Hi Dawn. Can we just start with your full name? Do you know much about your family’s history? Not as much as I would like to know, but I do know some. Can you tell me a little bit about [your family]? Both sets of my parents were born in Delaware County, not too far from East Meredith, and raised. My father grew up on a farm on Bloomville Mountain and my mom was the daughter of Louis and Fanny Wood. Louis worked at the Creamery at Doonin’s Corners for most of his career. My dad was Howard Hinkly and he was number 13, youngest of 13 brothers and sisters. He bought his first farm in Meridale and so we were there from around 1950ish until I was about four years old when we moved to the other farm on Route 7 near Oneonta. At that time that was the biggest barn, at least in the Northeast, it was built early 1900s all post and beam construction, big Gabriel style barn. So my dad had that farm until 1987 when he sold the cows and retired. Can you tell me some memories that stand out to you about your time at either of those farms? I think mostly summers. When you are old enough to be on your own and roam around with friends and swim in the river, and you know, once you’re at a certain age you have to work on the farm, you have to help with the hay. We would be able to go swimming or go to the fair or whatever once the chores and the hay were done, and if it was a good haying day that might last until dark. So those things came first but the upside of that, having to work, was that it gave me a lot of good work ethics. I’ve always thought that growing up on a farm and in the country was a big advantage, [that] may not be the right word, but I am glad I had that benefit of growing up in that environment. Because of the hard work but the freedom too? Well, the work and just being able to appreciate nature, not that I have great knowledge, but just a total appreciation for our environment and water and woods and trees and surroundings that we live in. If you are in a city you can’t hardly see a tree or enjoy a lake or a river as easily. What was the land like back then in this area? Well, I don’t think it has changed a whole lot in my time. I fished with my grandmother a lot when I was a kid so I knew a lot of these streams in this area, here in East Meredith, but also the Susquehanna River, my dad’s farm was right on that river so we explored the river all the time, and fished, and found all the good swimming holes. So as far as the landscape changing, I don’t feel like I’ve noticed a big change. I know there was a period of time when they said you should not eat a certain fish from the Susquehanna River, they decided if you had too much of it it could be bad for you, that was kind of weird. My dad was, very early on, interested. When I was still in high school I remember talking a lot about dependence on fossil fuel, oil. There was the oil embargo, I don’t know if you remember that. At the gas pumps you could only fill up on certain days. As far as things changing I guess that is what comes to mind. Can you tell me a little about your dad? Yeah, he was a very hard worker, smoked cigarettes until he was about 70 years old. He didn’t drink alcohol, only a little bit you know, putting in hay he might have a cold beer at the end of the day. He was a hard worker and wanted to please my mother and make her happy. Other than his awareness about the environment he was just a hard working farmer. He was involved with the community as much as he could. They went to an organization where farm families would get together at a person’s house once a month. Other than square dancing I think that was extent of their social life! [laughter] When you work a farm you are there 24/7. What were your childhood interests? Well I had a horse that I rode. I got the horse when I was probably 12 for Christmas. So I loved riding my horse until I turned 16 when I discovered cars, so the horse got sold [laughter], because I wasn’t taking care of it as much. There was no point in keeping it. I wanted to be a doctor, now we are going way back, I kind of thought that would have been cool. You’ve mentioned that as a young person you were curious about how things were built. Do you remember when this curiosity started? Right, and you know that is one of the childhood memories of my dad. He remodeled a house that we moved into once we moved to the other farm, and I followed him around everywhere. When I got old enough to use power tools and I learned how to use power tools was from that experience, remembering seeing my dad do that. Followed him around to the barn, everywhere. I was a tomboy, I wanted to do all the things dad was doing basically, whether it was carpentry or whatever. What age did he start letting you help with that kind of stuff? Well, I know I picked up a drill once when I probably shouldn’t have and it got caught in my pants, but it did not hurt me. It just kind of got wound up and I realized I needed to let go of the trigger [laughter]. So, you know, I’m sure dad didn’t just say “here go ahead with this drill.” By the time I was a teenager the remodeling was pretty much done, so when I would have been able to manage the tools I was already in high school, and you know how we get when we are teenagers [laughter]. Really quickly about the farm, it sounds like it was a pretty big operation. Yeah, today a farm that is considered big has hundreds of cows. My dad at the peak of his production for milk cows was close to a hundred, and as I said he sold the cows in 1987 so that would be considered a smaller farm today. Did you notice any changes in the family farm or the dairy industry in general over those years? I remember my dad was always talking about issues that were going on with not only the environment but other things like the farming industry as corporate farms were getting bigger and bigger and prevalent in every area. And I don’t know if I ever really understood the politics of it but people would dump their milk to protest. Of course he wanted to make a good living and get as much for his milk as he could, but he could never bring himself to spill milk into a drain, it went against him so much he couldn’t do it. I remember him talking about that; he thought that anybody who would throw away good food was a bad idea. Yeah, I have two sisters, one younger one older and an older brother, and the brother that was next to me in age got hit by a car in the road at the farm that we had just moved to on Route 7, busy highway. He was only five, ran across the road, sad. I think that event did affect all of us, you know, long term, because it is hard to lose somebody. I think it must have been very hard on both of my parents. That’s really tough. So, you’re sixteen and you are interested in cars. What was it like being a teenager? I had saved up money from babysitting. In those days you could babysit if you were a responsible twelve-year-old, people were spread around, so I babysat. Raised enough money to buy a 1964 Corvair, “unsafe at any speed.” They had the motor in the back and the trunk in the front. It was Ralph Nader I think that dubbed it as unsafe at any speed. It was a very cool car and I was not a speeder, but they felt they were unsafe cars. They didn’t take them off the market, well maybe they did stop making them. Yeah, I had my car, it was that freedom feeling, that you can just get in your car and go somewhere. Went to the Oneonta schools, graduated from Oneonta High. I took one college course in Native American History because I do have some Native American ancestors. I had children very young, I was just out of high school not very long. Sort of having a family, getting a family. I always did regret not going to college. I think I would have done well. Life has been my teacher. Were there any people during that period who stood out as people who pushed you forward or inspired you? Yeah, I think people mostly people that I worked for. With some exceptions of course, but some of the jobs I have had I’ve been fortunate that there were people who were successful and were good leaders. It was nice to have that kind of experience. Wightman Lumber was one of them. They had good things to say, they were positive people. How many jobs did you work before you started at Wightman? Maybe just a handful, I was just a short order cook at what used to be a snack bar at a place called James’ Way. Those stores went out of business years ago, but the James’ Way and the Price Chopper were under one building at one time, and then it moved to a different spot, but when it was still one building along that same corridor where the Price Chopper is now there was a little snack bar in there. I worked there. The person managing was a college student who I was maybe just a few years older than. At Christmas time it was terrible because it was so backed up and she occasionally wouldn’t come in on time [laughter], so that was not a job that I felt was any kind of career, it was just kind of doing it. They did away with the snack shop right about that time. It was sort of at the tail end of them wanting to have that part of it, eventually the store was dissolved and turned into some other store. They offered me to stay in the store but I went on to something else. I worked for a veterinarian for a little while. I really enjoyed that; it was part time work. I was just a helper in the clinic, but I liked doing that a lot. What was it like with family and work, was it difficult? It was tough. It’s tough. In all honesty, I was very early on interested in woodworking. I started out refinishing furniture, anything made from wood I loved it, I loved to put my hands on it, fix it or change it in any way I could to make it better. If I’d had my druthers I would have been a stay-at-home mom with my hobbies, if it had worked out that way. This was all at the same time where there is all this social pressure where women should be working, and it’s like, yeah, I guess. Because I’ve always liked earning money, there was no issue there, I liked earning money, but juggling both is tough. And that’s just being honest. You mentioned that you worked as a seamstress? [laughter] No, that never happened. I took the test for the application and they have you do a little stitching with a machine. The man was very nice, he said that I really should look for a different type of job. Then I ended up working at a retail store in the sewing department [laughter]. I did that for a little bit, but that was still during school, after school and weekends. And then marriage got in the way of continuing my work career so, get married, and have a child within that first year and half and then another one comes along about three years later, and then a short time, maybe a couple of years later and we are divorced. It was kind of rough and tumble, rocky for the kids, and everybody. At that point I had to be thinking more full-time work than part time, and the kids were in school by then. I had been doing some daycare at home when the kids were still small and before the marriage broke up so I was able to do some work from home. I always liked the idea of having work, everybody does, where you can set your own hours. You can’t really do that with daycare. I have tried some self-employment; I may go back to that after this retirement. I was hoping we could get to you starting at Wightman. Right. I worked for Dr. Fassett and that was part time. From there, worked at Wightmans. That was probably 1985ish. I was born in ‘55 so you’ll have to do the math [laughter]. So Wightmans hired me and it was right down the road, so it was a much more convenient job. Get the kids off to school and go to work. I kept that, probably would have stayed there. The winters are rough at a real mill. Someone from the museum, Rob Shapiro, was the mill foreman at the time. He was at Wightmans buying some lumber one day and started up a conversation with me. He said you really should come over to check out Hanford Mills Museum. At the time I had not really even heard about it, and it had not been going on for that long and when you are busy with kids and working the rest of the world is, you know. So I checked it out not immediately but a-ways down the road. I remember thinking “oh, I really should check that out.” So I did, and that is where this all started. What were you doing at Wightmans? Handling lumber. Tailing a machine almost identical to the Hermance moulder in [Hanford Mills]. At the time they had not upgraded to their new, more modern machine. They had made their Hermance the safer model with the safer cutter heads. I stood behind that, their Hermance was, as I said, nearly identical to [the Hermance at Hanford Mills] – most of the days, because I worked in what they called the Planer Shed. That is where all the kiln dried boards would come to be milled into whatever they were going to be made into, boards, or molding, or flooring, that kind of thing. Did you get a sense of Wightman changing with the times in terms of technology? You mentioned the moulder being more safe, but were there other things that were happening? Yeah, during the time I was there they built a new Planer Shed. The small one that I was working in was about the size of the main mill building. There were probably four or five machines in there is all. It was very crowded. If they were running the rip saw, like the rip saw that we use here that you are familiar with, but you’d have these rips. You know how we get the rips that have to be dealt with, that is your waste, everything needs to be managed and processed. I remember the time there was this really heaping pile of the rips that had to be taken care of. Some of the conditions – and this is not to say anything bad because mills are mills, they are not always safe, you try to make them safe but there are going to be things that can happen. You are in the production mode. I tripped one day on a piece of the wood that was sticking out. Talk about a sliver, this was about a quarter of an inch in diameter and it stuck in my shin. But I probably shouldn’t have been doing what I was doing, maybe I had to get to certain spot, I can’t remember. But they were very good about things like that. They [would say] “oh you’re hurt, let’s take care of it,” just like we would here. It sounds like you have some fond memories of the Wightman people. Yeah, they were good. They were very understanding. I mean they did not want you to be late every day. I remember I was driving my kids from the babysitter, from there they went to school and I had been late maybe three days in a row I think, and Dave [Wightman] met me at the gate with his arms folded like this but he was not angry. He was not mean or threatening. He was just a good leader. He’s like “what are we going to do about this?” There were so many things, wisdom. You have probably heard me say this “use this before you use this” as he points to his head. Use this before you use your muscle. Lots of practical, maybe common sense things that I learned from that job. Can you tell me about the first time that you came to Hanford Mills? It was the Spring of ’87. I drove in to this parking lot here, although the admissions building was down there [towards the mill race]. Anyway, I walked on the site and walked around until I could hear some voices and I found a couple of people working in what we call the bag room, where all those machines are [next to the Grist Mill]. That was different then, there were some wood racks where they kept big cants of wood, usually 6x8s and 8x8s because they were doing a lot of wood turning at that time with the lathe that is in the back of the box shop. They were storing that and other kinds of things. So maple, that kind of thing? No, it was mostly pine. They had a big rack for that. They were probably setting it aside so it could dry a little bit further before they turned it, I think. And that’s where I met Rob Shapiro and John Stacer. John was the programs person and Rob was what they called a Mill foreman in those days. They were like “hey, stop by the office and fill out an application.” I don’t even remember filling out an application. Keith Bott was the director at that time. I had a little interview with him and I got hired to be here as an interpreter. When the fall came and the Mill closed down – October 31st in those days they went May 1st to October 31st. So I was like, “what am I going to do,” and I had already talked to my dad. I was living in a house at the farm at the time, and divorced, so I talked to my dad about helping do the milking to help pay rent. That is what I was going to be doing but then I got a call from Keith and he said “we’ve got plenty of sheet rock and carpentry work and things to do in a couple of buildings, do you want to come back full time?” So that is how that happened. So this after the first year of being an interpreter? No, that was the same season, at the end of that season I was put on full time. There was a little bit of a falling out with Rob and the museum and he quit at the end of that season, which I was not fully aware of until I was called back. They were in the process of looking for the Mill foreman at the time so that’s when they hired Steve Eastman eventually. So my official position was Mill Assistant. A year or so later they hung Gift Shop Manager and Mill Assistant because they did not have anybody to manage the gift shop at the time and I had had a little retail experience so I am like, “I can do that, I can find time to order stuff, and keep track of things.” So I did that. So then Steph Covart, she was an office assistant, and I became good friends. She would – once in a great while – dye my hair for me [laughter], no she gave me perms that is what it was. I’d get a perm. If you see a couple of the older pictures that’ll be Steph’s work. So Steph also had some retail experience so she kind of took that over when she came on board. But for a little while I did that. Then Steve Eastman left after a few years – I’m not sure how long he was here, maybe four – I would have to sit down and look at the dates. Keith then decided I had had enough experience that I could handle the Mill. Then it became M.O.M., Mill Operations Manager. Shortly after that Keith left. They hired a new director and she was kind of cleaning house. I do not think she would have let me go but I foolishly quit anyway because she was firing a lot of people and I knew we were not going to get a long very well, so that’s when I left for a few years. So this is the early ‘90s? Yeah, this was ’94ish, ‘5. Can you tell me a little bit about the Mill in the 80s, what were they doing here? What was it like? When I came on board the sawmill was running. They had just acquired the Odie Green collection. A lot of those machines are in the basement of the Feed Mill. Things like the rolling top table saw came from Odie Green. I know there were a few other pieces that were identical to what the Mill had [as a working Mill] but had gone when the Pizzas had their auctions. Through that they were able to get a lot more machines. So the process of putting more machines online was taking place. Lots of belts and pulleys and things being put back where they thought they had been from the evidence they could see. The tub cover machine came in during that first time around. The same one that we are using today? Yeah. It was set up in a slightly different space, but in the same room. When Rob Grossie came along he did some research and discovered different evidence. I think where it is now is actually where it operated because I have these fantastic pictures of how the sunlight hits that room, [these were] some of the moves that Rob made. At that time the barriers were up and people could move through but maybe there was this concern that if we put it here we won’t be able to have the visitor flow. There was a visitation boom in those days, we saw a lot of visitors, especially on weekends. There was rarely a weekend where we saw less than 30 people a day. I’m sure there are some attendance records that we could look at. It is getting back to there, but [back then] the fuel was still cheap, people travelled more. I don’t know. During those years you must have been bumping into people who were either part of [the Mill] becoming a museum in the ‘70s, or even people from before when it was a working Mill. Do you have any memories of those folks? People that actually worked in the Mill or on the Mill or maybe [were] part of the restoration? Yeah just of the people from the time before you had started there. Yeah, well Larry McClintock worked a lot on restorations. Kind of drawing a blank. So John Hamilton, for example. Right. I did not know John previously to working here. My parents probably knew of him because all the farmers knew each other. I always felt – with grandparents who did business with this place – that there was always a strong attachment, for sure. I guess the answer is yes, a connection to just about everybody, at least spiritually. Is there anything they told you about this place as a working mill that really struck you? How the Mill operated, how the Pizza brothers were or even the Hanford’s before them? Maybe things that you say during your tours about those folks? There probably is and I am hoping I can remember something of it right now. Just the fact that it is still here is so remarkable to begin with. Can you give me a hint because it is probably something that I have said to you? Are you getting at a specific thing? Sure. Has anything stood out to you about the Hanford or Pizza family that you think might be good to remember? So some of the funny stories I have heard are like the butter tub cover pieces flying up into the attic spaces. Oh, so there are the oral histories and some of the diary quotes that make it all so real, so human. Like Horace [Hanford]. It is believed he cut a finger pretty badly and had to go from playing the cornet to the trombone. If you work around machinery long enough you will get a – hopefully not too serious – injury. The tub covers flying. Horace’s son Ralph was interviewed and that was the room that he remembered most as a boy. The pieces were probably flying through the air and people probably were not thinking anything of it. In those days you had this wonderful machine that could earn you money. It was a great thing. I didn’t know Ken very well. I think when he had his windows and door outlet down here in Davenport Center he had already sold the Mill. He had acquired the Mill through the Pizza auction but this was already in his past. He located down there with his windows and doors shop. Actually, I do not know if he already had that during the same time he owned this. I remember going there to try to buy a window or a door or something from him for my house. I might have bought something and he got his wallet out to get my change and it was just stuffed full of money. I have never seen a wallet so fat as Ken Kelso’s. He was a wheeler/dealer with all things. But he did a wonderful thing with this Mill, saving it, that’s for sure. That what he was like, a wheeler/dealer? Yeah, I think a character. I think I knew him more by reputation. Stories that I heard were kind of funny. He must have liked wild animals; he was known to have a wild monkey when he was still a dairy farmer. And the monkey would swim in the milk. Now that story I have heard from different people – whether it is really true. I guess the inspector really came down on him, they found out about it. Can you imagine? And he had wild animals in cages. So he was a character, you know. It sounds like he must have been a super busy man, just doing all kinds of things all the time. 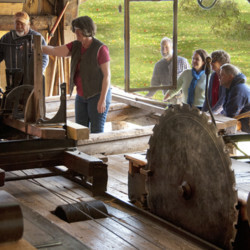 Have you heard stories about the Mill when Ken Kelso was operating it? What was it like? Wow, so it really was like an attraction? Yeah, he really was going in that direction, I think. I don’t judge him for that or anything, that was just who he was. It’s lucky that he bought it in the first place, somebody else might have torn the whole thing down. I have heard that it was a little bit less safe back then. I have heard stories about kids on the waterwheel, that kind of thing. Katrina Lions would be the one to ask about that. I remember her saying that she was one of the kids who would come here to play, and so was this visitor I just mentioned. They would hang out and explore things when none of the adults were around. But it was not a working Mill at that time. It was in that in between stage. Yeah, it was a hangout. So you got involved again here in the late ‘90s? Whatever year Liz Callahan started as director, which I am thinking was 2000. She started calling me to help with school groups and that sort of thing. Had you gone back to Wightman? No, I worked some retail. I was in the Carpenters’ Union for a little while. I was self-employed after leaving here that first time around. I was doing light carpentry, painting, some woodworking, trim, that sort of thing. I was able to do part time for Liz. Let’s see, I took a full time job at Belleview Builders – well it was Archers at the time – which was a lumber and building supply and paint store. I am trying to put things in the correct order and I may not be getting it just right. But some carpentry and at the paint store. Yeah and then I think is when Liz started calling me back. That makes more sense because it was between ’95 and 2000 that I was freelancing. 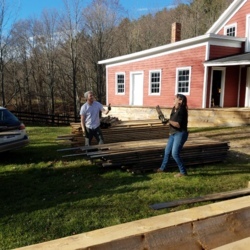 I did take a full time job at the retail lumber store and then left that to help Scott start his business, the storage business, we had to clear about an acre of land and build some steel buildings and I set up some bookkeeping for him, that sort of thing. I wanted to go quickly back to the Carpenters’ Union. You’ve mentioned in the past some dynamics between the old school guys and you. Can you talk a little bit about what it has been like to work in this world as a woman? Yeah. Mostly really good. Occasionally a little bit threatening. You know, “How am I going to deal with this situation, this guy is not into the whole idea of women working.” Although that was such a rare case, really. It happened a couple of times that I can remember. I think that I already had some of that in me, you know, with experiences with my dad, so it seems like something that I knew already. It just sort of happened. I did not set out “I am going to be woman working and eventually I am going to run a sawmill.” None of those things would have occurred to me. I’ve always wanted to improve my skills with woodworking, I got to be pretty good, I have done some pretty good work. There was a period of time when I thought about going to a woodworking school and become much better. I toyed with the idea, “Would a women be able to do, would it help and excel.” You know, in today’s world, maybe it would be a good hit, you know, but that ship has kind of sailed. I still enjoy it. I still love to wood work. I think I will always do that, as long as I can, work with my hands and with wood. Yeah, I would not mind selling some stuff again, I had done that for a little while. In between doing all of these other things I was doing some part-time woodworking for myself and sold some things to some craft stores. But mostly for Bob Ives, who did the railroads under glass. For ten years I made something like ten tables a year for him. That was like a part-time thing. I have been able to make money with it, but have not had the luxury of investing or focusing all of my time on it. Did I stray from your question? You were wondering about working in a man’s world. I think in my case I feel like I have been treated fairly. I don’t mind if a guy is going to be a little chauvinistic and open a door, that certainly does not bother me a bit. I do not consider myself a feminist feminist, I just feel that I happen to be a woman and happened to have learned certain skills that I can use and that are useful. So you come back to the Mill around 2000? Yeah. Again there was some part time and the full time started in 2007. So another ten years full time. There was a lot of subtle changes, things that are not really that significant, I don’t think. They have adjusted the hours and have downsized a little bit. The [old] admissions building is now called the Learning Lab. They felt that the flow of admissions did warrant an extra staff person. So they have had to downsize and adjust for the economy, resources and so on. I was thinking about this the other day – that we used to get the small cross cut saw out with not every group but with school groups – certain school groups. Kids would actually get to saw a block of wood with the two-man saw. We kind of do not do those sorts of things anymore. We let them pound nails, help build a box, but I would like to see us getting back to some of that stuff. What do you like to use in the Mill, what tools? Oh, the wood lathe, I would love to spend more time with that – the one in the back of the box room that I referred to. That is a lot of fun, turning wood. But of the ones that we operate on a daily basis, I don’t know, the sawmill. I did finally get to be friends with the sawmill. The first couple of years it was like a marriage – that we had to learn to love it. Now, giving it over to Rob I realize how much I did get to know about that machine. It is far different from any other [machine]. The rest are kind of just ordinary machines that you can cut wood with. 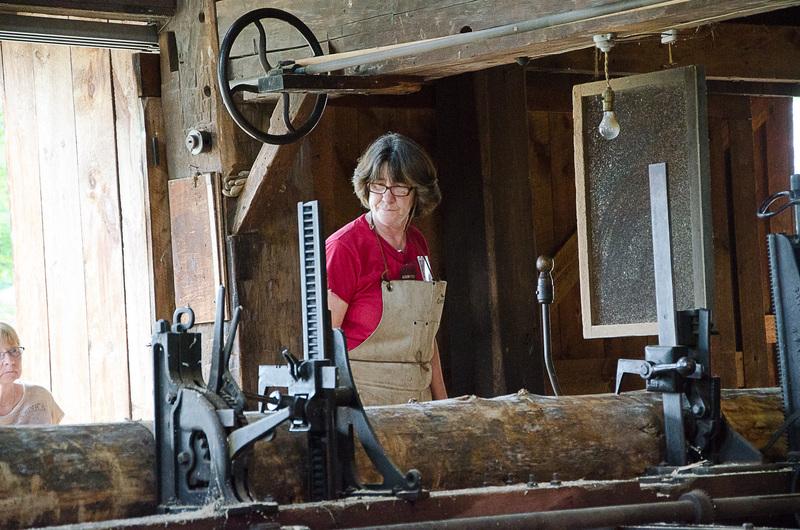 Where do you like to spend time in the Mill? I spend a lot of time in the tool room but that is because it is where all the modern tools are. Try to keep that organized or working on prepping material for demonstrations. But I think one of the nicest spots in the Mill is in the box room by the back corner where you can hear the stream. And on a sunny day – you know – the sunlight is coming through the windows. That is a nice place. And the waterwheel, of course, the waterwheel. Do you ever take a nap back there? [laughter] Yes, yes I have. Very short nap, once in a great while. You have to recoup once in awhile. You have told some funny stories about people you have worked with here. Is it Bill? Bill Brindle! [laughter] Bill was an interpreter here for about 18 years, and he started in 1990, maybe ’89. At that time Steve Eastman was the foreman, he worked under Steve. Bill was a World War II vet and although he never said it to me I think he might have been one of the persons that did not think I should be doing what I was doing. I pretty much confirmed that later on when I came back in ’07. Bill was still here and he pretty much told me that I was not up for the job and was not going to be able to do anything right. This is a Bill quote: “It is going to go to hell in a handbag.” Bill was retired and probably well into his 70s at that point, and as you know as we get older we get very opinionated and say what is on our minds. So I tried to take it with a grain of salt. I am not sure how funny my Bill stories are, I suppose I have been able to put a funny spin on him from time to time. God bless him I have not seen his name in the obituary, he is a tough old bird. He was hurt because Rob left, I think. Are there any funny stories from your time at the Mill that you remember? I know it is hard. It is. For my memory to kick there has got to be one of those sights or sounds that jolts that memory. Yeah, there has been a lot of good times. Years ago when the Ice Harvesting first started up, the first or second winter maybe, we had ice skating before the ice was opened and we were just clearing it and it was thick. People from the community came and we cooked hot dogs. Yeah, it was great. It was a good community event. It was not even an event, we just put the word out somehow. Was it a bit more casual back then? I don’t know. Keith Bott was the director and Keith was, in many ways, a good leader but he would look over your shoulder a lot. We had worked on orders for Handsmans flowers for these boxes that we were making and things like that. He would actually have me inventory every little part and piece and want to know why there was a couple of extra pieces when we only needed this many pieces. He even told me once that “if my checkbook is even off a nickel I will not stop until I find that nickel.” So he was really to the point where I do not know how he could enjoy himself. He was very intense about this place but he had a lot of work to do. There is still a lot of work that is going on. It will never not be the case. There was a lot to manage. I remember moving big machines from one place to another because of this acquisition and finding a home for it. They built the “Complete in All Departments” exhibit during that time that I worked for Keith. Good times though, Rob Shapiro – you could never get away with this today – but at the end of the day there would be a six pack on the picnic table and we would all sit down and have a beer. And I think it is relaxed enough that we could do that here today too, but times change, you know. What are you excited about for this place? Liz has already started with the roofs being done. The real basic maintenance that is so important. Exhibits are cool or putting a new machine online is cool but taking care of what is already here is so important. Roofs are big. If there are issues with the foundations in the Steam Engine room, where the pier of the engine is compromised. I think it will survive time, but I think it would be a luxury to not worry about the fancy stuff, let’s worry about really taking care of the buildings and staying on top of that. Being able to have enough help to do that, and resources to get that all done. I think that is important. 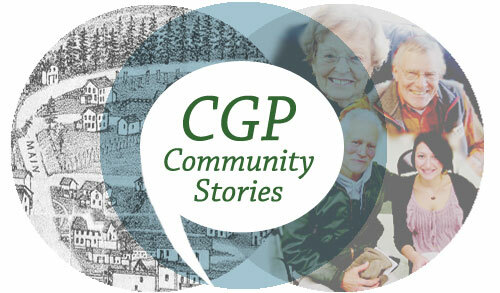 Karl Wietzel, “Dawn Raudibaugh, November 8, 2017,” CGP Community Stories, accessed April 25, 2019, http://cgpcommunitystories.org/items/show/338.